The California PopTop truck covers have been completely redesigned. These new covers are made using an aircraft-cover-quality material which makes them stronger and more rugged. 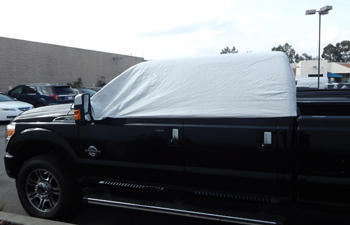 The new truck cover material uses DuPont's Tyvek material bonded to a sturdy second layer. 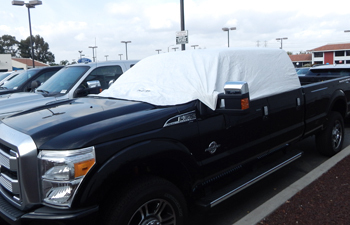 These cover still retain the Tyvek quality characteristics of blocking 99.8% of the Sun's UV rays which will protect your interior from sun damage and keep the interior of your truck as cool as if it was parked in a garage all day. 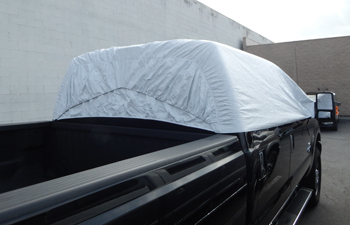 The new California PopTop truck covers also have a new fastening system that will work on your truck no matter the size of your outside mirrors, and will not blow off. Don't let your interior burn up when you're parked at work or play! Easy to Install & Remove - in Less than a Minute! To Stop the Heat from building up within your cab, you have to Stop the Sun from getting through your windows. Windshield Sun Shades can't do that. The California PopTop was selected as a recipient of the international New Product Award from among 2200 new products introduced at the SEMA Show, Nov. 2006. The California PopTop was featured in The National Tradeshow Reporter's special automotive edition publication as one of their Top 25 Product Picks from SEMA 2006. How Does it Stay On the Vehicle? The California PopTop has a patented fastening system that keeps it firmly attached to the vehicle without utilizing a series of 6 to 8 straps and hooks which are common on other products. The cover material is a non-woven fabric (no fibers to trap dirt), so you can hose it off or hand rinse. Then, hang it up and let it air dry. 2-Year Limited Warranty! We stand behind every product we sell. If you experience a problem with the PopTop we will either repair it or send you a new one. Proof of purchase is required. Money Back... Guaranteed! Try it on your CLEAN truck. If you are not satisfied with the PopTop return it within 7 days of receipt for a full refund of the purchase price. You will be responsible for return shipping charges and delivery confirmation. Customer Service: If you have questions about the product, please contact us by email or phone (see contact page). Payment & Checkout: Please provide vehicle YEAR, MAKE & MODEL with order to avoid any sizing mistakes. Payments are processed through PayPal using your Credit Card or PayPal Account. We also accept phone orders by calling 661-257-7830, and money orders. If mailing payments, please identify your vehicle on your payment. Once we receive your payment, you will be notified of status via email. When your order is processed you will be notified via email of shipment status and tracking number. Shipping: Items ship on the same or next business day following payment clearing. Items are shipped by USPS Priority Mail and are insured. Delivery time for U.S. orders is 1 to 3 business days. Delivery time for International orders is 6 to 10 business days. You will receive an email from the U.S. Postal System when your order ships with your tracking number. The correct size is indicated after the vehicle model below.